Expo 86 was going to be held in Vancouver and my parents invited me to go. I suggested we take a train trip on the British Columbia Railway (BC Rail from now on) and they thought it was a great idea. They suggested maybe Jeff Hartmann would like to come along. Since Jeff had to work he would meet us in Vancouver by taking Amtrak up. This got my mind working and when my parents said that we would be passing through Spokane on the way back, I proposed a Spokane-Seattle-Portland-Spokane triangle trip which they all agreed. Now my mind went into high gear. Why not come all the way home on Amtrak using a one region All Aboard America Fare? This would allow me to stay at the Issak Walton Inn in Essex, MT someplace I always wanted to stay. I booked my trip on the Empire Builder, Coast Starlight, Empire Builder, Pioneer, California Zephyr, San Joaquin and San Diegan on the Amtrak portion. I called BC Rail for tickets for their train, I was all set for my first Canadian train ride and my first trip ever on Amtrak's Empire Builder. 7/15/1986 It seemed like the day took forever to come, but we finally packed up the camper for the three day trip to Vancouver, Canada. This was the first time in years I had travelled in the camper with my parents. It bought back all of the memories I had as a child going on vacations with them and how much fun it really was. I really missed riding in the back of the camper and that might have led to my love of riding in the train. I mean sit back and let someone else do the driving with the freedom of being the passenger and moving about. Seemed like a train to me. 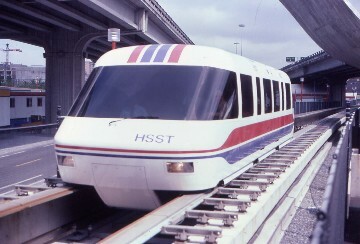 7/18/86 We arrived at Tsawwassen and spent the next two days at Expo 86. One high light was the Japan built Mag Lev. It was incredible to ride it and it was so smooth. It has top speed was 48 MPH. I saw my first Canadian football game at the BC Palace. Jeff showed up the night of our second day here coming off of the Coast Starlight and thruway bus. His connections worked out perfectly with me meeting him at the bus stop right around midnight. After a good night's sleep we all drove to North Vancouver to the BC Rail Station to wait for the start of my first Canadian train ride. For a few views of Expo 86 Click here. Canada has a national rail service called Via Rail, but the BC Rail does not belong to it. 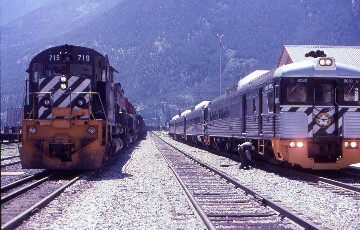 The service runs with Rail Diesel Cars (RDCs) normally, daily, to Lillooet and tri-weekly to Prince George due to the Expo 86 it's chosen to run to Prince George daily all summer. The line is single track, with no signals, as everything is done by timetable and train orders over the radio. The line began to be built in 1912 but was not completed until 1952. 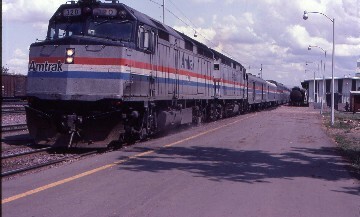 The railroad's passenger service is RDCs with each car being self propelled and powered by two 300 horsepower Cummins Diesel engines. 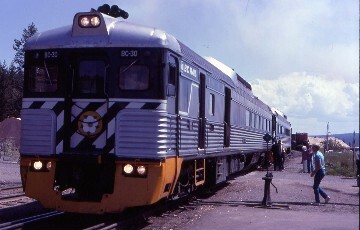 They can be operated singly but almost always coupled together usually in two or four car trains. There are two classes of service - First Class or Cariboo Service which has more luxurious seating and meals at no additional charge or Regular Coach seating. 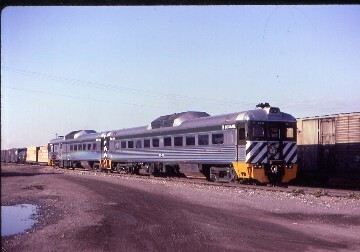 RDCs come in a variety of styles from the coach model and the Cariboo Class cars that have a baggage compartment, galley and the Cariboo seating. Due to the terrain the train will pass through it will stop at any time or at any place to deliver groceries, mail, newspapers plus anything else. The 461 mile trip will take 13.5 hours, but because of the summer sun in the northern latitudes the trip will be made in complete daylight. I always wanted to ride an RDC after seeing them go by between South Edmonton and Calgary. As I walked out of the BC Rail Station and out to these vehicles I stopped and took a good long hard look at it before I boarded. Jeff and I found a pair of seats. It was twenty minutes before train time so we went off and explored our new train of four RDCs coupled together. Our Cariboo Class car has superior seats and better leg room than the regular coaches which have seats too close together. Their interiors are not as colorful or as nice as ours, but are functional no less, for the service they provide. We returned to our seats and waited for our departure. The train left North Vancouver right on time passing through the BC Rail yards and by the Royal Hudson Steam Train being readied for the run today to Squamish. Once at the west end of the yard the train passed under the Lion's Gate Bridge and below it was a spot where I once photographed this train years ago. This time I am looking out at the spot where I took the picture. Breakfast was served which was a waffle with the best tasting sausage that I have ever eaten. We then crossed the Capilano River and headed through the heavy urbanized suburbs of West Vancouver literally passing through the residence's back yards. These homes are some of the most expensive in all of Canada. We slowly have been climbing to the 4200 foot Horseshoe Bay Tunnel one of the largest on the whole railroad. We stopped at the end of Horseshoe Bay siding and waited for a long BC Rail freight train with two engines on the point and three radio controlled units buried mid train. By running their trains in this fashion it minimized the need for helper districts over the up and down profile of the railroad. We proceeded to back out of the siding onto the mainline before the train passed high above the community and ferry docks of Horseshoe Bay. We returned to water level as we rolled along the Howe Sound. Jeff and I walked back to the rear RDC vestibule so we could enjoy the scenery better and take some pictures. We passed the islands out in the Howe Sound with the Coast Mountains rising behind them. To our right the highway is backed by the sheer cliffs. 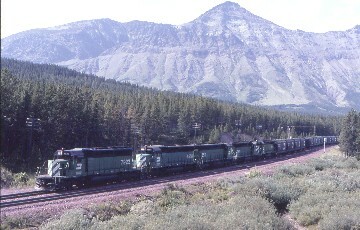 Most of the peaks on both sides of the train are above 6,000 feet and heavily forested. The sound and the mountains are totally beautiful with the train reflecting as we pass the still waters. The train passed the Provincial Park located near Porteau Crossing then continued along the shore to Britannia Beach where there was a small harbor. As I looked forward up the head of the sound I saw Mt. Garibaldi looming high above the surrounding peaks as the train twisted along the shore. On the right we next passed the Stawamus Chief which is said to be the second largest rock in the world. It is a monolith and even on this morning I saw climbers on the face which looms 2,000 feet above the train. We came to the northern end of the Howe Sound and made our first station stop at Squamish where BC Rail locomotive and maintenance shops are located. Leaving Squamish the train started a 2.2 percent grade, the steepest on the entire railroad. 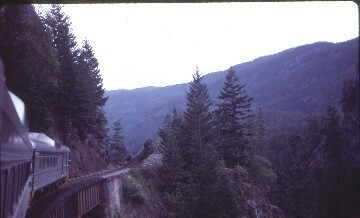 We are following the Cheekeye River into the Coast Range by the way of Checkumus Canyon. The train twisted and turned heading up the narrow rocky gorge. The ride in the vestibule was incredible and the conductor came back to say "Hi" and to see how we were enjoying the ride. He looked down, saw my camera and said "You are going to get some great shots today Aye!" I think so because with the great scenery how could one not get great pictures. We crossed the bridge which the RDCs were pictured on a Pacific Great Eastern timetable which was the former name of this railroad when I was a kid. It was this picture that made me want to ride this railroad and at this moment I was crossing that bridge. It was an incredible feeling to live out one of your life's dreams. We passed by Brandywine Falls which was named by a group who were betting on the falls height with one group betting wine against the other groups brandy. By the name you can tell who won but that has to be one of the strangest stories on how a place got the name. I still wonder how I was named Christopher Dean Guenzler. After passing through the canyon, we stopped at Whistler which is a major ski resort that has been advertising in Southern California. 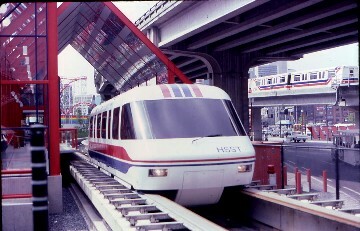 BC Rail offers an excellent way to get to it from Vancouver, which is just an airport away from the rest of the world. Leaving Whistler we came to Alta Lake and the summit of the Coast Range. Descending from Alta Lake we twisted and turned down into the Pemberton Valley, a very fertile part of British Columbia. At Pemberton we dropped off Vancouver newspapers for the local town folk and then crossed the Lillooet River sixty miles from the town with the same name. 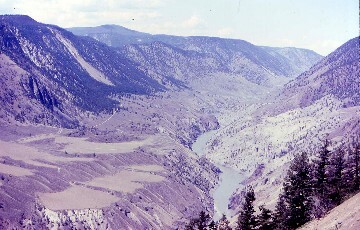 The Lillooet River flows southeast out of the Coast Range joining the Fraser River near Chilliwack. From Pemberton it's another climb, this one up to Birken which is the summit of the Cascade Range and one of the last helper districts on the railroad. The mountain peaks are some of the most beautiful and less seen in the world, something I did not expect to find on this route. I always love the surprises that mother nature can provide me. From Birken we descended the grade to D'Arcy and the south end of Anderson Lake. We traveled along Anderson Lake which has a depth of 700 feet for the next fifteen miles. We plunged into a short tunnel and there was a helicopter photographing our train before flying out in front of us for his next picture as we passed by. It was really interesting to watch him maneuver his aircraft. The whole event was entertaining no less. The whole valley was glaciated and is in the "U" shape design. The lake at Seton Portage which as actually located on the remains of a huge landslide which we crossed is before we started our running along Seton Lake. 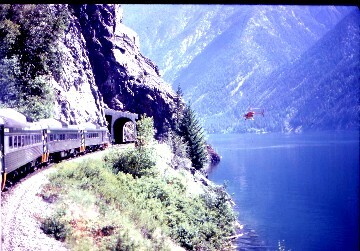 We headed into a long 2,940 foot tunnel and emerged hugging the shoreline of Seton Lake which had a milky blue green color to it and with our shore running the helicopter continued to photograph us. I wished that I could get a copy of that film to show people the beauty this train runs through with me in the vestibule right in the middle of it all. To our left is Mt. McLean and across the lake is the Cayoosh Range. We passed the town of Shalath from which BC Rail runs a school train into Lillooet for the children who named the car they ride "Budwiser". 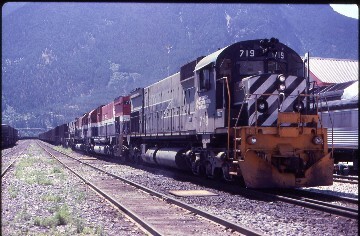 Seton Lake is as deep as Anderson Lake and BC Rail has had several derailments putting locomotives into the lake followed by a very costly savage operations to retrieve them so in a few cases they could be rebuilt. 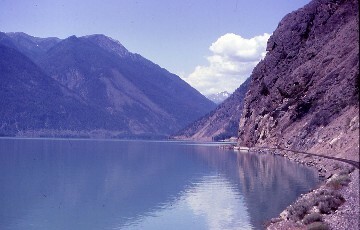 At the north end of Seton Lake, the train runs along the Power Bridge Canal which serves as part of BC Hydro's water delivery system. It was also equipped with a fish ladder so the salmon can return to spawn. 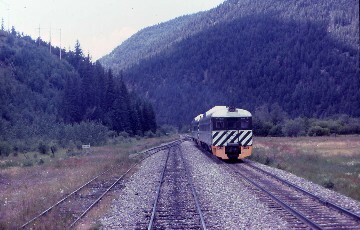 The train ran the last miles to the division point and next stop of Lillooet. Lillooet was a twenty minute stop. I took some pictures as they cut off the last two RDCs so they can return to North Vancouver in about two hours with the train from Prince George. 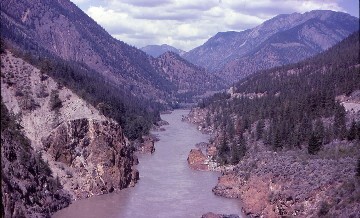 Lillooet sits above the Fraser River and was an important town during the Cariboo Gold Rush. While it is surrounded by mountains, the temperatures can reach 100 degrees in the summer but today it was only in the mid eighties. Lillooet would make a perfect one day up and back trip from North Vancouver. With a new crew, we departed north first passing the oldest suspension bridge in all of Canada before we crossed the Fraser River on a high steel bridge with the tracks over 200 feet above the river. I enjoyed all this from my new location in the new rear vestibule. The train will now climb 3,000 feet over the next thirty miles to gain access to the Cariboo Plateau. The rails hug the east wall of the canyon as it twisted and turned to gain elevation. Across the river it is odd to see irrigated fields. I learned ginseng is grown here which is a medicinal plant. The view is spectacular as we continued to climb and gain height. It almost looked like a view out of an airplane. We came to Pavilion where we passed a freight train waiting in the siding. I am really impressed how BC Rail runs their railroad. Climbing up to Moran, the tracks are now over 2,500 feet above the Fraser River and at this point we left the Fraser River. I would not see it again until Prince George. At Kelly Lake we went into the siding to let Train 2, our southbound counterpart RDCs to go by us and I returned to my seat to change film. I then decided to see if I could ride up front of the RDC with the engineer so I walked through the galley, the baggage compartment and into the control area where I was greeted warmly and offered the fireman seat. I sat down and was told they would arrange it for me to seat up front all the way to Prince George. I was in heaven. I know that it does not get any better than this! Passing milepost 215, the engineer pointed out a deep canyon and told me that this spot is named Chasm with me understanding why. The view from the head end is incredible. We made the stop at the Flying U so passengers could detrain for a guest ranch. Just before Horse Lake we passed the highest elevation on the BC Rail at 3,864 feet. 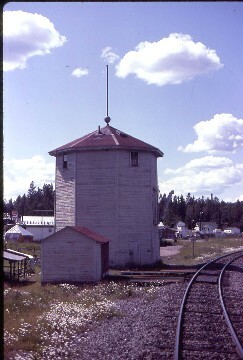 The train was speeding north and at Lone Butte we passed the old water tower which still stands. Just north of here a log truck cut right in front of our train and for the next five minutes the dangers of railroading were discussed. My engineer has had a lot of close calls but has never hit anything. I told a few San Diegan stories and was he ever glad he worked in British Columbia away from all of the crazies of Southern California. His points were well taken. When we talked about wildlife what do we think of? With him he gets to enjoy every type of animal the Cariboo has to offer. The conversation turned to Winter railroading and he ensured me that operating RDCs in Winter takes a little more concentration but it's fun year round. With all of the conversation we arrived at Exeter also known as 100 Mile House on the old Cariboo Trail. It was a pleasant little town very typical of Cariboo towns. Leaving town the engineer pointed out a herd of buffalo off to the right. Now that was something I did not expect to see in this part of British Columbia. 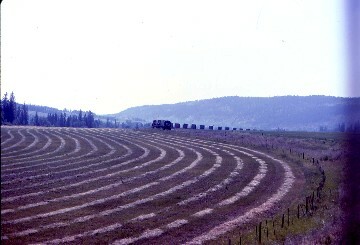 The train sped through the forest with the occasional patch of farm or ranch land. Cattle is an important business in Cariboo country which surprised me as I thought that the interior of BC was nothing but trees. We passed Lac La Hache (Ice Lake in French) which is a year round sportsman resort. We ran along the shore for eight miles. Further on we passed the scenic and deep blue Williams Lake before we arrived at the namesake city of Williams Lake which turns out to be the cattle capitol of British Columbia besides being a major lumbering center. At Williams Lake we changed crews and my former engineer introduced me to our new engineer who speaks with a distinct "Aye" at the end of every sentence from here to Quesnel. Williams Lake is bigger than I thought it would be and the surprises just kept on coming on this trip along with all sorts of new knowledge. Just as we were going to leave, a freight train rolled by us heading south. We pulled up stopped and threw the switch. We got to know each other and after talking for twenty minutes, our engineer told me to get my camera ready. We came out of a curve and headed out onto the Deep Creek Bridge which is one of the highest in the World, 312 feet above the creek and is over 1,200 feet long. It was the highest bridge that I have ever been over and I was sure glad I am not afraid of heights. Two words describe the bridge and the crossing, totally awesome! We passed Soda Creek where from 1863 to 1921 river steamers plied the Fraser River between here and Prince George. The railroad was the late comer to this area. The countryside was rolling and the train made great time across it as we were right on schedule. The engineer gave me a rolling history lesson on this part of British Columbia and I must say because of the friendliness of the BC Rail crews I have learned more today than on any other of my trips. Just before Quesnel he let me see his employee timetable and noticed that I was really interested in it. At Quesnel I gave it back to him and thanked him for such a great trip since we were going to change crews again. Before he leaves he told the new engineer not to leave until he returns. A few minutes later he returned with a bag and told me to ride with him tomorrow southbound, shakes my hand and off he went. I opened the bag and inside found five brand new BC Rail employee timetables. His kindness has made my whole trip. Quesnel is another lumbering town besides serving us a major trading center for the region. The new engineer introduces himself to me and notices I am ending all of my sentences with "Aye". After he finds out that I am a native Californian, he laughed and said "I guess with that accent of yours, I make you an honorary Canadian!" Well if I had to live anyplace else I always thought Canada would be the place for me as this trip proves, I would fit in fine here. Suddenly the radio came alive with chatter as that freight we had passed at Williams Lake derailed just south of Exeter with twelve cars all over the ground. By the sound of it, it was pretty bad with the dispatcher holding trains at both Williams Lake and Lillooet until the tracks were cleared. The engineer asked me when I was going back south and when I said tomorrow he responded with "They will most likely bus you from Exeter to Lillooet. The road that way is really pretty so you will get to see something different!" So much for my cab ride down the Fraser River canyon and grade into Lillooet but I still have the rest of the ride today to enjoy. We left Quesnel on our final division of today's journey and have about a two hour trip ahead. We passed rows of lumber plants as we departed into the early evening but being so far north we will still reach Prince George in daylight. This trip has been funny as there has been no rain or even a single cloud in the sky which is very unusual for British Columbia but do I really need rain in the summer? On the outskirts of Quesnel along the highway there is a huge gold pan, pick and shovel paying tribute to the local history. After twenty minutes we crossed the Cottonwood River Bridge which is 234 feet above the river. This bridge was not completed until 1952 and was the final link in the Pacific Great Eastern Railroad between Quesnel and Prince George. Like the Deep Creek Bridge this one is truly impressive at 1,023 feet in length. The shadows are covering the cuts as the sun starts to descend in the west. My engineer pointed out the Ahbua Creek Bridge where a silver spike ceremony took place here back in 1952 with the joining of the rails and the completion of the railroad. We continued our trek through Cariboo Country crossing minor bridges and taking a few curves as the train really made some good time. We have the Fraser River back on the west escorting us into Prince George. The train passed the lumber mills and went through the BC Rail yard prior to the BC Rail Station where we arrived with me still in the fireman seat. What a trip. I went back to the coach section, met my parents and Jeff before we detrained to a taxi to take us into Prince George. The BC Rail Station is to the south outside of town. We went to the Simon Fraser Hotel where we all spent a restful night. For a more views of our northbound trip, click here. I was back in the fireman's seat as the train pulled out of Prince George. My mood is somber as the train passes through the yards and heading south. I think of the bus ride ahead that I will be taking. The engineer did say it was scenic so it might not be that bad plus, I will get to go on a road I never been on before. The road will rejoin the tracks around Moran so I will get to see part of the descent into Lillooet but from a different perspective. One of my better ideas runs through my mind, live in the present. Look where I am at, the fireman seat of this RDC. How many other people would wish that they could be here instead of me? Thinking that thought returned a big smile to my face. I was glad I did my photography yesterday because we were basically heading into the sun. It was funny when you travel down a rail line you rode yesterday you see it in as totally different light. The engineer discussed Barkersville with me and said if I ever get the chance I should go and visit it. Barkersville is a famous gold rush town along with Wells and is where one can get a living feel of Cariboo History. The conversation soon turned to fishing which I will do if I have the time and to hunting which I will never do. The only hunting that I will do is for trains and animals armed with only my camera. He said "How do you fish Aye? Take a picture of it?!" We both drop the subject after having a good laugh about it. He has his views while I have mine and we leave it like that. We crossed Cottonwood Creek high in the air without a single cloud in the sky and twenty minutes later pulled into Quesnel and I thanked my engineer for a nice two days of riding with him. We switched crews with me being greeted with "How did you like your present Aye?" I responded with "Fantastic Aye!" and off we went towards Williams Lake. Just south of Quesnel we passed a northbound freight but it's just the cars from Williams Lake staying on their schedule heading north. "You have to keep freight moving on both sides of a derailment or you lose more money if you shut the whole bloody railroad down. Remember that railroads have to make money to survive!" my engineer said before the conversation turned to BC Rail's future. "I know we will continue and with the Tumbler Ridge coal line exporting to Japan that brings BC Rail big bucks. Plus we continue to grow and develop new on line traffic, I would say BC Rail has a bright future!" Sounds good to me! We continued our southbound trek and as we passed Alexander I got told the story of Fort Alexander. It was the last Fort built before it was taken over by the Hudson Bay Company in 1821. It amazes me the reach the Hudson Bay Company had in the wilds of Canada before the roads and railroads came. It really impresssed me how they opened up the whole untamed North. We flew out onto the Deep Creek Bridge and in the bright sunshine of the day it looks deeper than it did yesterday. We made a quick run to Williams Lake and I said goodbye to our engineer. He responded with "Try to come back up here! We love having you up here." "Thanks!" was the only word I could think of saying but I did give him a long friendly goodbye. He turned around and said "Take care Aye, I will." Up climbed our new engineer who said "At least you will be with me to Exeter then I will sit there and wait for the northbound buses to join me then I will come back up here. I really wanted to spent the night in Lillooet but I would not get there for two days. Tomorrow I will swap with the northbound wherever we pass to keep the rotation from being screwed up but I am glad you are here with me this morning! "Seems like I am not the only one who does not like what derailments do to passenger service. Off we went through Cariboo Country on 54.4 miles of steel rails until Exeter and the bus. We made quick time of it first passing Williams Lake just to the south of town and further on Lac La Hache. We pulled into Exeter and the waiting bus. Jeff and I took the front seat of the bus so we would have a forward view out of the bus. My number one bus rule is: I always try for that forward seat for the view and most of the time the driver who is bored anyway operating the bus is more than happy to strike up a conversation with you so this morning I used him as a tourist guide. I mean if I am being forced to come this way I want to know something about the things along the route that he takes us to Lillooet. South of Exeter we crossed over the tracks and we came upon the derailment site and what a mess it was with cars all strung about the rightaway and piled up. It was an amazing sight and if anyone who was on the bus did not know why they were on a bus now they vividly know by that view. We headed away from the tracks on a nice two lane highway which we stayed on until Cache Creek. To me it was just another Canadian Highway in the mountains, no brilliant peaks or outstanding scenic views just a nice scenic road with nothing out of the ordinary. Turning west at Cache Creek, the road twisted and turned to get up to the divide that leads to the Fraser River Canyon which we crossed and ten minutes later we were ducking under the BC Rail tracks. With the river on the right below and the tracks slightly above on the left this arrangement continued until the tracks bridge us before they cross the Fraser River and further downstream we crossed the Fraser River and arrived in Lillooet. 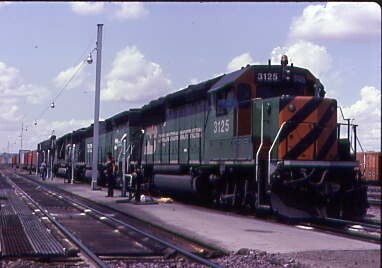 I debussed and shot pictures of two northbound freights in the yard while everyone else waited to board the train. The bus ride was not all bad but, "I rather be on a train Aye!" Back on the RDCs we were all happy to be back on the friendly train. The train departed with me walking forward and being invited into the control area so I could enjoy the views of Anderson and Seton Lakes from my now usual seat. At D'Arcy, Jeff found me and told me that they were going to start to serve dinner and that I have a seatmate. 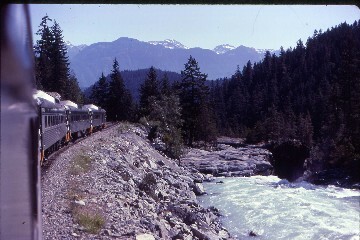 I went back and sat with a very attractive woman named Selah who was travel\ling from Lillooet to Squamish. The attendant bought us our meal of White Salmon, steamed round potatoes along with a roll and soft drink. Selah ordered a mixed drink with hers and I now found out this train does serve alcoholic drinks. We enjoyed our Salmon and I remarked "I have never eaten White Salmon before, in fact, I did not know it could be white." Selah gave me more than the necessary lesson about types of salmons, breeding practices and their run to spawn. I now knew more about salmon than I ever wanted and will limit my interest in them to eating them occasionally. Selah offered to buy me a drink but before I took her up on it, I showed her the view out of the front of the train. She is amazed and said she had ridden this train over twenty times and never until now has seen this view. We walked back and got our drinks going to a vestibule where we just talked while taking in the view together. She said while looking out at the passing view "Normally all of my trips back and forth are so boring and this one with you I wish would never end." I told her "That's how I wish all of my trips would never end and this one is no exception, but as long as the sun goes down in the sky every single day ever trip must come to an end!" She said "You should be a writer that sounded so good." "Maybe, someday I'll write a book about my train travels. How about a toast to a never ending train ride on a never ending day!" Clunk went our glasses and down went the drinks. She excused herself before she returned with round two. We laughed and talked past Whistler all the way down the grade to Squamish. When she knew that it was time for her to almost get off, for five minutes we kissed in a tight embrace with our conductor walking by at one point saying "Oh, pardon me, excuse me, I am sorry!" but we never stopped. We pulled into Squamish and off into the night Selah went waving goodbye as we left town. I know that I will never see her again but what another wonderful BC Rail memory she was. I walked back up to the front end a happy contented man and watched as the train skirted Howe Sound knowing my first Canadian Train Ride is almost over. The sun began it was long slow sunset as we curved above Horseshoe Bay and into the final long tunnel of the trip prior to rolling through West Vancouver. We passed under the Lion's Gate Bridge, through the BC Rail yards and pulled into the North Vancouver Station ten minutes early thus ending a most wonderful two day first Canadian Train Trip. We drove back to Tsawwassen and spent two more nights there. The four of us took the bus to Expo 86. Since I had been there two days already I acted like a guide for Jeff. I took Jeff to the Canadian Pacific Exhibition with Color Wars, the Canadian National Exhibit, over to Central Pacific Station before we rode the Japanese Mag-Lev a train running on a cushion of air. Top speed is fifty mph on a short test track but it was interesting to ride. We spent the whole day at Expo 86 and after three complete days I had seen almost everything there was to see. An Expo Hint, an exhibit with long lines you can almost always get into without a wait either first thing in the morning or at meal times. Seems as if everyone is hungry at the same time so eat at odd times then see the most popular exhibits at meal times for everyone else. For a few views of Via Rail at their station Click here. We left Vancouver and drove back into the United States in the camper down Interstate 5 to Mt Vernon, WA. 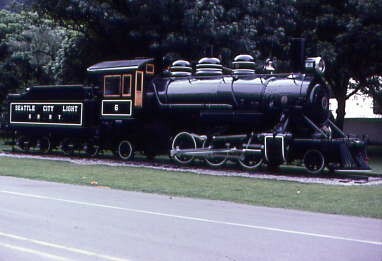 We caught Seattle City and Light 2-6-2 6 at Rockport. We turned east crossing the Cascades on Washington Highway 20 to Washington Highway 17. We traveled through Grand Coulee then onto US Highway 2 before arriving at Spokane in the late afternoon. We found a place to park the camper for the two nights before we went and had dinner. We taxied to Amtrak to wait for the westbound Empire Builder and my first trip on this route. The train pulled into Spokane right on time in the dead of night but passengers are not allowed to board until the train is split into two sections ours for Seattle and the other to Portland. Tomorrow night I will be on those Portland section cars being combined here for my trip to Havre. When all is ready we boarded the Seattle section with our car attendant giving us a boarding pass with an exact seat number making it easy to find our seats in the darken car. The conductor took our tickets as Jeff and I fell asleep at the late hour. Waking up in Leavenworth we went to the lounge car for the crossing of the Cascades across Stevens Pass this early morning. The hillsides are dotted with homes and barns. Suddenly we passed through our first tunnel of the morning. We crossed the east flowing Wenatchee River then plunged into another short tunnel finding US Highway 2 running along side of us. We passed an eastbound Burlington Northern (BN) freight at Merrit then crossed stream after stream with the mountain views becoming more and more beautiful. The train headed up a steep canyon along a creek with more bridges and another tunnel before we arrived at the siding at Berne waiting for an eastbound freight to clear the next tunnel We sat there for fifteen minutes until the freight train came. I learned later we had to wait thirty minutes for fumes to clear out of the Cascade Tunnel, our next and longest tunnel on the Amtrak system at 7.8 miles long. We proceeded into the Cascade Tunnel and for the next eighteen minutes we passed through it's darkness. I went downstairs for some screwdrivers (eye openers) and breakfast. I returned to my seat with five minutes to spare. I am amazed and impressed with the length of this tunnel which is the second longest in North America after the Canadian Pacific's 9.1 mile long Mount MacDonald Tunnel in British Columbia. We emerged back into the morning light at Scenic with my eyes wide open. We are are now on the Pacific watershed of the Cascades and will follow the Skykomish River to the Puget Sound at Everett. Passing through Scenic we headed down the canyon before crossing the Skykomish River prior to entering a side canyon looping around to the Foss River and crossing it on a high trestle at the mid point of the loop. The scenery is very rocky with tall trees in this steep sided canyon which is quite beautiful. We passed the waiting helpers at Skykomish with a very nice hotel standing along the tracks. 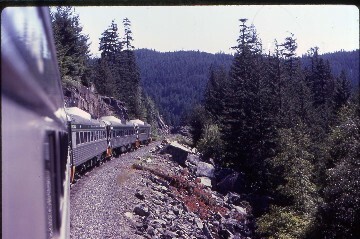 West of here we passed Sunset Falls with the cliffs now rising vertically, with Mt Index looming high above the train. We crossed the Skykomish River again at Index, then bridged the river two more times before we passed through Gold Bar. In just a few miles we left the Cascade Mountains behind as the countryside opened up as the train traveled through Monroe. Twenty minutes later we passed through a brief tunnel under downtown Everett before we arrived at the Everett Amtrak Station overlooking the Puget Sound. Leaving Everett we ran at water level along the shore of the Puget Sound twisting along it's shoreline. Across the sound on this very clear July morning I could see Mt Olympus, the highest peak on the Olympic Peninsula and the heart of Olympus National Park. Out on the sound I saw a few ocean going vessels heading to and from their ports at Seattle or Tacoma with their cargo. As we arrived at our next stop of Edmonds I saw the ferries which take cars from here to the Olympic Peninsula. We continued our water level trek passing a large refinery then skirted by the marinas before we crossed the drawbridge at Salmon Bay. We proceeded through BN's Interbay Yard, passed the engine facility before we ran along the Seattle Waterfront District. We ran along the Waterfront Trolley and Jeff said that he would go ride it on our layover. We plunged into the tunnel under downtown Seattle and came to a stop, fifteen minutes late at Seattle's King Street Station. Jeff went off to ride the trolley, my parents went to get some breakfast leaving me with the bags. Thank Heaven I brought some playing cards along and played Solitaire until all three had returned right before our second train of this triangle trip. We boarded in Seattle, and once the train got rolling along, Jeff and I headed to the lounge car starting out on the east side hoping for and then getting a view of Mt Rainer. We switched sides once we had reached Tacoma for the ride along the southern end of the Puget Sound. We stayed on this side all the way to Chehalis where we once again switched sides this time hoping for and getting a view of Mt. 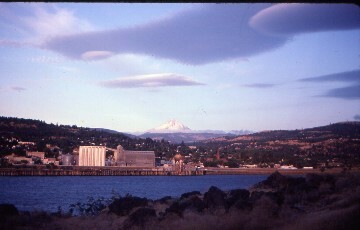 St. Helens. We returned to the west side of the car for the view of the Cowlitz River and what Mt. St. Helens did to it with the ash flow from the eruption in 1980. South of Kelso-Longview we ran along the Columbia River and after Vancouver crossed the Columbia River into Oregon and ran along the waterfront with the train yards before we arrived at Portland Union Station. We all walked into a very nice Station to wait for our next train. While we waited both the northbound Coast Starlight and Pioneer came through on their last leg of their trips to Seattle. After lining up at Portland we were finally allowed to board the Portland section of the Empire Builder. I am finding out I do not like Portland's boarding methods, so maybe in the future I will try Vancouver instead. We sat across the aisle from each other with my parents having the riverside through the Columbia River Gorge since I knew Jeff and I would be in the Sightseer Lounge Car and tomorrow I would have the Rockies out of my window in Montana. The conductor passed through the car after departure and took my parents tickets saying "Two for Spokane, very good." He turned to us, took Jeff's ticket and said "Three for Spokane." He took mine and with a puzzled look on his face said "One to Havre. Why are you going to Havre?" "I have never been there before and want to cross the Rockies in Montana all the way by train!" I said. "Very good Sir, I hope you have a great trip." As he thumbed through the rest of my tickets he said "Everywhere west. You must really love trains?" I smiled and nodded my head yes, enough said. Jeff and I walked to the next car the lounge car right behind the engine and sat in the non smoking section. We passed along the Willamette River waterfront, sped across the spit and crossed the Columbia River into Washington and turned onto new trackage of the ex Spokane Portland and Seattle Railroad (BN) and came to a stop at the Vancouver station. Passing through the southside of Vancouver along the river, we passed by the Chart House where we had dinner on our drive north and ducked under Interstate 5. We passed the lumbering industries east of town until it turned into farms and orchards before the train entered the Columbia River Gorge. Across the Columbia River standing out high above everything on this extremely clear Northwest day was Mt. Hood, Oregon's most beautiful mountain. The Columbia here is still very wide as the train sped down BN's well maintained mainline. We plunged into our first eastbound tunnel of the afternoon through a rock formation called Cape Horn. Following our lengthy period of darkness across the river was Multnomah Falls which is 620 feet high. I wondered what kind of view I would have from the Pioneer in a few days? Back to our side of the river where we passed Beacon Rock which is the largest rock in the United States, just slightly smaller than the famous rock in Gibraltar, Spain. Looking up it's face it was a most impressive sight as the train ran below it. We next passed the first of the dams on the Columbia River, this one called Bonneville Dam which forms a lake 48 miles long back up the Columbia. This dam as with all the other ones have a series of fish ladders to allow the salmon to return to spawn. Salmon, now where had I heard about them before? Past the dam there is a highway bridge over the river called the "Bridge of the Gods." The vegetation was changed from Northwest rain forest into a scarce vegetation zone of an almost desert type landscape. My first comparison between the routes on both sides of the river is I like the North Bank route better because it was just the river, the railroad, the two lane highway and cliffs not the Interstate highway on the South Bank. The cliffs are basalt columns laid down on top of one another and forms an impressive landscape. 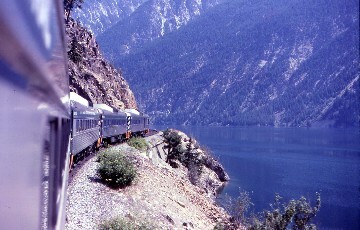 We rolled out on a fill separating us from the highway with a lake in between called Horseshoe Lake which had been used in publicity photos of trains over the years. Across the river is Hood River, OR which gave us another good long view of Mt. Hood. We came around the large bend in the river to our next station stop of Bingen-White Salmon. White Salmon now was not that my dinner on the BC Rail? 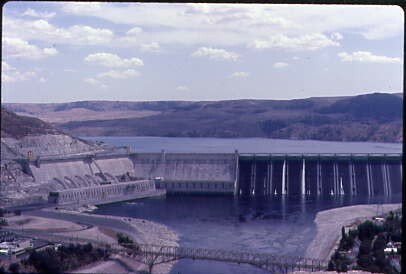 About twenty minutes east of here we passed The Dalles Dam with it's navigational locks along our shore and as luck had it there was a boat being raised up to continue its trek up the Columbia River. The dam itself has twenty two generators and sends out power to places as far away as Los Angeles. Further east we came to the wye with the railroad bridge over the Columbia River. This line known as the Inside Gateway was the Great Northerns link to Northern California. James Hill founder of the Great Northern dreamed of having a line to California and this line became it. Wishram was our next station stop and has a rather large railroad yard for a small place in the middle of nowhere but the location near the Inside Gateway which explains why it is located there. Leaving Wishram we passed under the US Highway 97 bridge about ten minutes later before running on the relocated tracks around the John Day Dam. The navigational lock here has a lift of 113 feet making it the highest single lock in the World. The dam has sixteen generating units so after we passed these three dams imagine how much electricity they produce together. How many cities would they light up? With the afternoon sun heading low into the west, we started to travel in the shadows as we turned the river bend towards Pasco. The river is narrowing as the bluffs began to lower at the same time. Across the river I saw a Union Pacific freight heading towards Hinkle, OR. We continued north but the darkening skies took over and we arrived at Pasco under the cover of darkness. From here to Spokane the train travelled over the former Northern Pacific tracks eastbound in order to get to Spokane. Jeff and I both decided to get some sleep and for the next three hours we were out. Ten minutes out of Spokane our coach attendant woke my parents and Jeff up so they will be ready to detrain at Spokane. I woke up to say goodbye to everyone and wished them all a safe trip, my parents in the camper and Jeff on the Empire Builder back to Portland, the Coast Starlight and a San Diegan home. We arrived on time, they detrained and I went back to sleep. I slept through the joining of the Empire Builder sections, across Idaho and well into Montana. 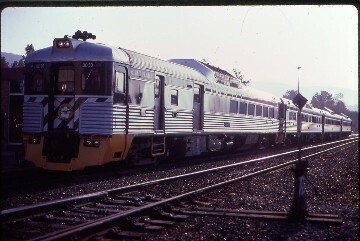 7/25/1986 It was a bright sunny morning as I woke up at the station stop at Whitefish, MT with the Bavarian style depot. 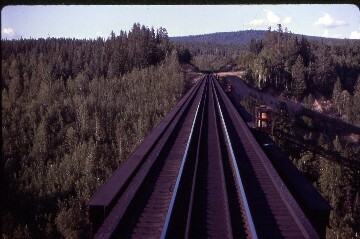 We departed on time heading east down the double track mainline to Columbia Falls the site of a large aluminum plant. The railroad turns into a single track mainline here as I made my way towards the lounge car where I found a seat on the north side and I am now ready for Burlington Northern's crossing of Marias Pass. Called Marias Pass it was discovered by John Stevens as the lowest railroad crossing of the Rockies between the Canadian border and the Mexican border at 5,213 feet above sea level. When I was in my early teens I bought my first BN Motive Power Annual. When I saw the BN in the Mountain section with the pages on Marias Pass with the helpers, snowsheds and mountain scenery I knew that I wanted to ride across it. When Railfan magazine did an article on the Izaak Walton Inn, I knew that I wanted to stay there someday so I put two dreams together and that is why I am here today. Ride across the former Great Northern this morning and afternoon before I stay at the former Great Northern Inn at Essex. A perfect combination even if I do say so myself. 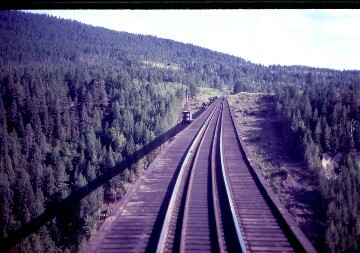 The train rode on a narrow ledge with a high cliff to the left and the Flathead River to the right. Forward of the train I got my first view of the peaks of Glacier National Park. We crossed the Flathead River then proceeded to Belton (West Glacier) our next station stop. This is the west entrance to Glacier National Park. When the Great Northern advertised the park they wanted the names to be easy to remember, hence West Glacier is Belton and on the other side of Marias Pass that next station is East Glacier. Leaving Belton the train now followed the Middle Fork of the Flathead River which is also the southern boundary of Glacier National Park and transverses a narrow canyon for several miles with a couple of tunnels along the way. The river has a few sections of rapids and made a lovely setting in this canyon. We exited the canyon and at Nyack the train is on double track. The valley opened up and the high peaks of the park could be seen. The Great Northern put in signs with the name of the peak on arrows signs pointing towards the peak. We passed a wye and the small place called Red Eagle before we ducked under Highway 2. We ran beside a small lake between us and the highway before we went under the road again, around a big bend in the river and came to the end of the double track at Paola. Back on single track the train dived into a long tunnel under US 2 for the last time for a while, passed the tiny community of Pinnacle, MT where east of here up on a ledge the railroad returned to double track. We passed the ballast pit where BN is busy making a ballast train. The summer months up here is the time of heavy maintence on this railroad. Further east we passed the yard at Essex, the helper terminal and then the Izaak Walton Inn where I will be staying tonight but I still have a big day a railroading to live through. We pulled around the corner and rolled past the Amtrak stop at Essex which is one of the few flag stops on the Amtrak system and since there are no passengers getting on or off, the train continued on. We rounded a curve and entered our first snowshed of the morning which is located high above the Middle Fork of the Flathead River. We passed over the Sheep Creek Trestle and across the river in the park is the Goat Lick, a natural salt deposit that the Mountain Goats do as the name implies. The Great Northern used a mountain goat as their mascot naming him "Rocky" as their corporate symbol. A perfect choice if you would ask me. 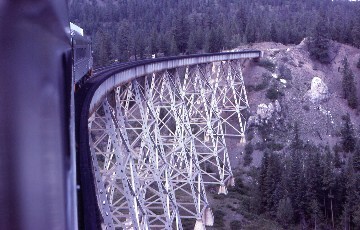 The double track ends at West Java and the tracks ran on a ledge high above the river protected by a slide detector fence. Turns out that the mountain here is very unstable and could not take a double track mainline along its base. We passed through some trees then out onto the high bridge at Java over the Flathead River before we crossed over US 2 with the railroad now becoming the southern boundary of Glacier National Park. We returned to double track at Java East and then started through snowshed country. The sheds were built to protect the railroad from both rock and snow slides. Avalanches are always possible in winter so the railroad took every precaution with shed and slide fences along its tracks. After passing through the last of the sheds we made a big horseshoe curve at Blacktail to gain elevation on our climb towards the summit. Highway 2 which has been down in the bottom of the valley is now gaining elevation as The Empire Builder glided through the Marias crossovers and around a corner to where those famous peaks that have been used as a backdrop in so many famous photos came into view. We made a gentle right turn and out to the right in the middle of Highway 2 is a statue of John Stevens who discovered the pass in minus forty degree weather. This is the same John Stevens that the pass that I rode over yesterday on the Empire Builder to Seattle is named after. Just east of here is the Summit sign that reads "Summit 5,213." The peaks gave way to the hills as the train started down the east side of Marias Pass which is quite tame compared to the west slope. The main difference is that on the east side you can see the whole range of peaks that makes up the summit of the Rockies. The peaks have glaciers on them hence the name Glacier National Park, We rolled to the next siding at Bison to find BN's hottest piggyback train cooling heals waiting for us to pass by. The foreground scenery may not be impressive but the backdrop is awe inspiring. The trees are stunted in their growth from the wind which comes off the mountains is extremely powerful. We wound our way down to our next stop, the log cabin depot at East Glacier. The Great Northern was the major player in first getting people to the park but also took care of them once they got there. Leaving East Glacier we crossed the Two Medicine River on a very high trestle before we reached the long siding at Grizzly where we rolled by another freight. We were now in the low rolling hills when our crew came on the PA and said "That's it for the mountains today!" Well maybe for them and the rest of the train but not for me. We made a big sweeping curve into Browning but the train does not stop here this time of year so we speed on through it to our next stop at Cut Bank after we crossed another impressive trestle just to the west of town. The train is passing through ranch country with a few wheat farms thrown in. After Marias this morning once you have seen five minutes of this countryside it does not change much until Havre but what you do is to look for things out of the ordinary. I would not tell you what they are, you will just have to ride this train to find out! Our next stop is Shelby with its biggest claim to fame was the title fight held between Jack Dempsey and Tommy Gibbons on July 4, 1923. Dempsey won the fight by a decision. From here towards Havre all the towns have English names like Dunkirk, Devon. Lothair, Inverness, Hingham and Gildford. The names may all be English but they are northern plain towns of the Big Sky State of Montana. I can see why they picked that slogan. We pulled into Havre twenty minutes late but the departing crew assured the passengers that they will make it all up by Minot, ND but for me I step off ending my first ever eastbound trip on the Empire Builder. I checked with the Amtrak agent and found out the westbound was running forty minutes late. I went outside to the north of the station and photographed the Great Northern S-2 4-8-4 2534 on display. I walked downtown to a nice looking cafe for lunch. When I went to the counter to pay for it I put a twenty dollar bill on the counter then started to smell something burning. The grill had caught fire so I grabbed a fire extinguisher off of the wall and assisted putting out the fire. While all this was going on somebody stole my twenty from off of the counter. The owner was shocked by this and offered to make it up to me so he offered me sixteen dollars worth of candy. I said "Thanks but that's ok. I hope everyone would help out in a situation like this." She said "At least take something." I took a Nestle Crunch Bar, two Kit Kats and three Butterfingers. As I walked out she say said "Hey!" and tossed me a two pound bag of M&M's and said "May God bless you!" As I walked away I thought I had made a difference which was a very good feeling. I walked back to the station and talked with the Amtrak agent until the westbound Empire Builder arrived. 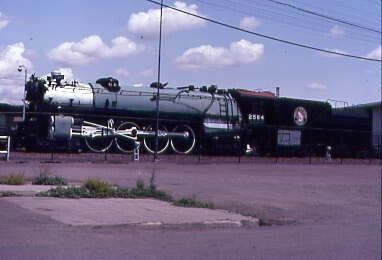 Great Northern 4-8-4 on display at Havre. I boarded the Empire Builder for Essex and my first visit to the Izaak Walton Inn. The conductor took my ticket and since I had two long and late nights on my Empire Builder trips so far, I decided to take a nap to recharge my batteries. I mean did I want to see all the plain scenery of Montana again so I dosed off and woke back up near Browning now fully recharged and ready for the Rockies for the second time today. The continental divide with it's beautiful snowcapped peaks are back lit bit still make an impressive barrier and end to the Great Plains. Makes me wonder when John Stevens saw them for the first time did he ever dream there could be a pass for a railroad? In Glacier National Park only the Going to the Sun highway crosses the divide on a steep twisting route which goes over a 10,000 foot pass. The road is only open for about four months a year and takes a huge amount of effort to reopen it from the heavy snows of Winter late every May. So when Stevens found that really low pass he must have felt if he had been blessed by God. I walked back to the lounge car to enjoy the late afternoon climb over Marias Pass. We crossed the Two Medicine Bridge again and stopped at East Glacier. The conductor came through and pointed out each of the peaks with the history of their names. My favorite is Triple Divide Peak, the only peak in North America where water runs off of it into three different oceans, the Pacific, Atlantic and Arctic Oceans. The climb is very rapid with the train passing through Bison and then Summit before starting the westward descent. I just sat back and took the whole crossing of Marias Pass in. It was so incredible and I am glad that I am making the crossing twice in one day. The snowsheds came next with the sun now behind the mountains, We crossed the high bridge at Java followed by the slide zone at which point I walked back to my seat, collected my bags and met the conductor who led me downstairs as we passed through the final snowshed. The train stopped and I stepped off onto an asphalt platform with lights. I had arrived in Essex, Montana. I was met by Larry Vielleux. He and his wife Lydia own the Inn. I was taken by van to their Inn where I was checked in and given my room on the second floor track side so I could keep an eye on the railroad. The bathroom was down the hall so I did my absolutely favorite thing after a train trip which is to take a nice long hot shower and did this one feel good. Now cleaned and refreshed, I went to the Flagstop Bar in the basement and enjoyed a few drinks as I looked at all the pictures on the walls. They give a great history of the railroad, Essex and Marias Pass. Following a lengthy look at the pictures, I went upstairs and off to bed. Essex has been a long time helper stop since the beginning of the railroad. 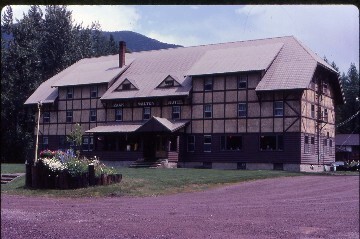 The Inn used to be at East Glacier. The Great Northern got the idea of opening up a southern entrance to the park. Essex would have become South Glacier. The plan did not work out. The Inn was moved to the present location but the Great Depression hit and the railroad never gave it a second thought. The Inn was used by railroad crews and as beanery with a few guests occasionally staying overnight. The Great Northern sold it and it passed between owners until Lynda and Larry bought it and it is now a leading cross country ski area in the State of Montana plus very popular with Railfans. 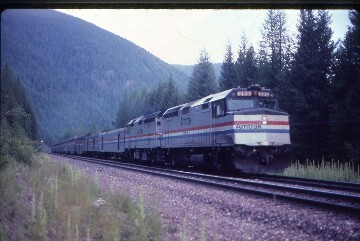 7/26/1986 Day One of my visit started with the photography of the eastbound Empire Builder then a wonderful breakfast with a track side table. I spend the morning hiking to, through and on top of the first snowshed which is an excellent place to work on one's suntan between trains. I noticed black clouds coming overhead but I also heard an eastbound freight train working towards me. Thunder echoed off the peaks so I wondered which will get here first the train or the rain? The train won and after it passed the sky let loose so I took shelter under the cover of the snowshed or in my case the rain shed. The shower ended but the sky did not look all that friendly so I decided to return to the Inn by a quick walking pace and just got underneath the porch when the sky let loose for the next hour. I went up to my room and watched two freights go by in the pouring rain. It was funny that after all the clear days I had on this trip why does it have to rain on one of the two days when I am off of the train and on foot? Once the shower ends I decided to hike through the yard and down along the tracks towards the ballast pits and was rewarded by five freight trains over the next three hours. The air is so clean and the views so beautiful, my walk is at a very relaxed pace with stops to take in my new surroundings. I returned to the Inn for a wonderful fried chicken dinner at my usual track side table. Walking out into the lobby, Larry introduces me to Fred from Iowa who has the Inn's rental car and invites me to go out with him tomorrow for a day of shooting pictures out on Marias Pass. I took him up on it and we went out to shoot a picture of the Empire Builder passing the old Essex depot in the last low light of the day. With darkness returning, I went downstairs to the Flagstop Bar for my nightcaps before calling it a night. 7/27/1986 Sunshine greeted me the next morning as I had breakfast with Fred and we discussed our photography plans for the day. We'll follow the eastbound Empire Builder out to Browning then wait for a westbound freight which we will shoot back to Summit then play the rest of the day by ear. The plan worked like a charm and we had a successful day of photography on Marias Pass. I had an excellent steak dinner and went to the bar for a last round of drinks before Larry drove me back to the Amtrak platform. I wished Essex a very happy goodbye knowing I would be back. I would recommend the Izaak Walton Inn to anybody. I had a wonderful time with many special memories of this place as I stepped onto the westbound Empire Builder which I am already planning on coming back to. For pictures during my Izaak Walton Inn stay Click here. The conductor led me upstairs and the other passengers wondered where I had come from and as we passed the Isaak Walton Inn I pointed to it and said "There" with a chorus of "What a nice place to stay!" I responded with "Yes, it's very nice!". I little free advertising for the Inn never hurts. I stored my bags and went for a few rounds of nightcaps as I watched the evening scenery pass by. Just after Whitefish I went back to my coach seat and fell into a deep restful slumber. 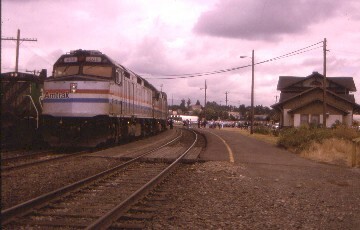 7/28/1986 The next morning found me on the ex Spokane Portland and Seattle tracks which are rumored to be closing in the near future between Spokane and Pasco. I was glad to be riding on these rails so after waking up I enjoyed the last few miles into Pasco. I traveled down the North Bank of the Columbia River seated in the lounge car drinking screwdrivers. I just sat back and enjoyed the trip through the Columbia River Gorge. The only difference besides the lighting on the eastbound trip is the Union Pacific Railroad on the Oregon side is a very busy railroad and there is more barge traffic on the river this morning. After Wishram the conductor walked through and I asked if I could board the Pioneer in Vancouver instead of Portland as I do not like the way they board the trains there. He said "That is fine, Sir. Amtrak considers Vancouver and Portland to be the same place." We had a wonderful trip the rest of the way through and out of the Gorge and I detrained at Vancouver's very nice wooden depot. Since we arrived on time, I spent the next hour and a half shooting pictures of trains on this very busy stretch of railroad with both BN and UP trains operating over it until my next train arrived. We departed Vancouver and I am crossing the Columbia River for the sixth and final time on this trip. We arrived in Portland early with my through car filling up with people going to Pendleton, OR. We left Portland on time, travelling east along the Interstate 84 and the new light rail system under construction. We ran out to Troutdale but had to wait until a UP freight train cleared onto the freight only line into Portland that stays along the Columbia River. We passed Multnomah Falls which I thought had the better view from the Washington side of the river. We made stops at Cascade Locks and Hood River with westbound BN freights passing in succession across the river on the North Bank between the stops. The Gorge can be a very busy place of railroading provided you are on the right side of the river at the right time. Leaving The Dalles, it was lunch time so I ordered my usual lunch of hot dogs. If Amtrak did not have hot dogs on their trains I would have probably starved long ago on their trains. We passed under the Inside Gateway with no trains on it as usual then continued up the Gorge over the excellent track of the Union Pacific at 79 mph. We turned away from the Columbia River and passed by the Umatila Army Depot where I saw a military switcher shuffling cars about. Our next stop was at Hinkle right in the middle of the UP's huge rail yard before we travelled up a nice canyon to Pendleton where my car emptied out. The Pioneer started the climb up the Blue Mountains with a freight in every siding. Our next station stop was at La Grande on the opposite side of the Blue Mountains which I enjoyed crossing again. La Grande emptied out most of the rest of the train so our load going to Utah will be very light according to the conductor who told me, "Five cars for fifty people is not very many but it's an easy crowd to work for." There was only one seating for dinner which was done at a very leisurely pace. While I was being served my BBQ Chicken dinner we crossed Telocaset summit before we descended to our next stop at Baker Oregon. The Pioneer then climbed to the summit at Encina as I finished my delicious dinner. I went to the rear portion of this car which serves as the lounge section and ordered three nightcaps to take back to my seat. We went around the horseshoe curve at Durkee as the sun set behind the Blue Mountains and we arrived a few minutes later at Huntington in twilight. We crossed the Snake River into Idaho for twenty four miles before we crossed the river again back into Oregon to our station stop at Ontario. East of town we crossed the Snake River back into Idaho for most of the reminder of the night with myself turning in before Nampa. This is my first trip that I would not be getting off in Pocatello since my brother Bruce moved to Davis, CA where I would be visiting him in three days. 7/29/1986 I awoke in the early morning just as the Pioneer was pulling into Ogden, UT. We proceeded down the UP mainline to Salt Lake City in the early morning twilight bringing back all those memories of those Desert Wind trip to and from Ogden to see my brother Bruce in Pocatello. We arrived on time in Salt Lake City and while our cars are being switched onto the California Zephyr, I walked over to the park to view the UP 834, a 4-8-4 on display there. I returned to the train to find my car was now the last car on this fifteen car train right before we left town right on time to continue our trip east. The Zephyr made good time to Provo then headed east over the Wasatch Mountains crossing Solider Summit before the Zephyr descended the grades to Helper. The upper level bar was opened for one of the few times ever when I have ridden so that made ordering my screwdriver very easy this morning. The train sped across the Utah desert flying through Thompson another flag stop and entered Colorado in Ruby Canyon as the train started the 232 mile journey along the Colorado River. 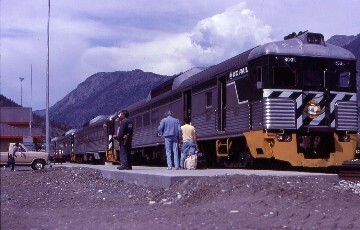 We stopped at Grand Junction for servicing and I started my first eastbound trip over the Rio Grande to Denver as Grand junction was always my turn back point on trips from Idaho except the time I rode the Rio Grande Zephyr westbound. Dubuque Canyon came first then a stop later at Glenwood Springs. Glenwood Canyon was as beautiful as I remembered it although they have started the construction of the Interstate 70 since my last journey through it on the Rio Grande Zephyr. We went to Dotsero and started our trek over the Dotsero Cutoff though Red Rock Canyon to Bond. East of Bond the Zephyr negotiated Gore and Byers Canyons before I had Rocky Mountain Trout for dinner as the train stops at Granby and Winter Park. I returned to the lounge car for a few after dinner drinks for our passage through the Moffat Tunnel and then the descent down the Front Range to Denver where we arrived on time. I taxied to the Travelodge for a well deserved hot shower and a good night sleep in a stationary location. I awoke to another bright sunny July morning and after my daily plumbing chores I checked out of the hotel and asked for a taxi cab to be called. The desk lady asked "Where are you going?" and I responded with "Union Station," and she said "You can take a city bus for a dollar and it will take you within two blocks of it." I decided to try Denver Transit and fifteen minutes later I was back at Union Station being the third person in line to get my boarding pass for the California Zephyr. The train arrived from Chicago and within twenty minutes I have found my seat then walked back to the lounge car for my trip up the Front Range of the Rockies and today's ride across the entire Rio Grande. I will be in this vantage point until dark when I went to the dining car for a well prepared Steak dinner as the train transversed the Utah Desert after dark. I had an evening of nightcaps over Solider Summit before I was asleep prior to our arrival in Provo. I slept through the shuffling of cars at Salt Lake City this time as my car sat stationary in the station. 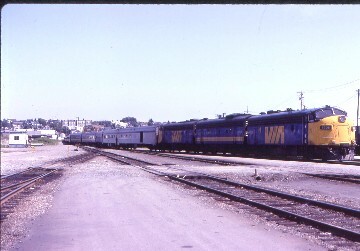 7/31/1986 The next morning found the California Zephyr west of Lovelock with the train right on schedule. We traveled through the Humboldt River Sink. We had been following the Humboldt River most of the way across Nevada. We picked up the Truckee River just past Fernley and followed it to Sparks, Reno and into California to the namesake city of Truckee. At Sparks the train is given it's 500 mile servicing which allowed for a nice stretch of my legs. We picked up a full train's worth of passengers in Reno and then entered California to Truckee. We left Truckee and started our climb over Donner Pass and after going through the Summit Tunnel I went back to the rear door for a picture out of the window. The rear brakeman was sitting there and said "You can not get a clear picture out of that window. Let me open the rear door and you can take pictures as long as you want. Just let me know when you are done please." I said "Thank you so very much." and I shot pictures all the way down to Sacramento. It was incredible and it gave me a perfect understanding of Donner Pass. It was a memory that will last forever. Leaving Sacramento the train made a quick trip across the Yolo Bypass to Davis where I left the California Zephyr, met my brother Bruce, and stayed with his family for one night. The next morning I went with my brother Bruce to work. He was the Amtrak agent in Davis, and waited for the Coast Starlight. I got on the southbound Starlight so I could connect in Martinez to the San Joaquin for a morning trip across the California Delta. The fifty two minutes on the train was long enough for a screwdriver plus a good look at the Mothball Fleet before we went over the drawbridge to Martinez where I detrained in the bright California sunshine to wait for my next train. Southbound San Joaquin 708 arrived right on time and we were off down the last few miles of Southern Pacific track to Port Chicago where we switched onto the rails of the Santa Fe. We passed the large US Steel plant at Pittsburgh before passing through Antioch and reaching Knightsen, the start of Delta Country. In this part of the Delta there's is not a lot of water as the landscape has been reclaimed for farming and the water channeled. 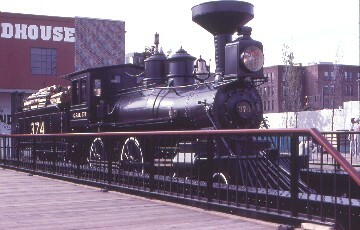 At one point there are channels running on both sides of the train and at Middle River there was a working drawbridge. We continued east and just short of Stockton there is a second drawbridge after which we made our station stop at Stockton. Once out of Stockton we started our race down the San Joaquin Valley clipping off the miles at a rapid rate. The station stops came in rapid succession, Riverbank, Merced, Madera, Fresno, Hanford, Wasco and Bakersfield. With me on the last day of the trip, the feeling of home pulling at me and I am a bit impatient to get home but as usual I am having my morning of drinks that led into the afternoon of drinking until Bakersfield. I was off of the train for a non descriptive bus ride over the Grapevine to Los Angeles Union Station. I climbed aboard San Diegan 580 for the quick trip to Santa Ana to home and a hot shower completing my first Canadian Train trip, Empire Builder trips and other assorted trains in the Amtrak west region of the All Abroad America Zone.